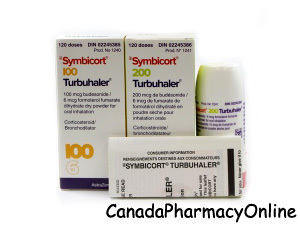 Find the best deals and order Symbicort Turbuhaler at guaranteed low prices through our Canadian pharmacy. We currently have the brand name Symbicort from Turkey manufactured by AstraZeneca. The generic Budesonide/Formoterol also called Foracort inhaler comes from India and is manufactured by Cipla. Symbicort Turbuhaler is available in the strength of 100mcg/6mcg/120dose comparable to (80mcg/4.5mcg/120dose), 200mcg/6mcg/120 dose (160mcg/4.5mcg/120dose), 400mcg/12mcg/60dose (320mcg/9mcg/60dose) Turbuhalers. Symbicort (Budesonide/Formoterol) is a combination of Budesonide and Formoterol. It is used to prevent bronchospasm in people with asthma or chronic obstructive pulmonary disease (COPD). Budesonide is a steroid which works by reducing inflammation in the lungs and airways. Formoterol is a bronchodilator and it works by relaxing the muscles in the airways, which makes breathing easier. The two medications work together to prevent bronchospasm which is a sudden constriction of the muscles in the airways. You should not use Symbicort inhaler if you are allergic to Budesonide (Entocort, Pulmicort, Rhinocort, Uceris) or Formoterol (Foradil, Dulera, Perforomist). Before you start taking this medication, talk to your doctor about all the medications you are taking including OTC and herbal medications. It is unknown whether Symbicort will harm an unborn baby. Inform your doctor if you are pregnant or plan to become pregnant while using this medication. Budesonide and Formoterol can pass into breast milk and may harm a nursing baby. Do not breast-feed while using Symbicort. Budesonide can affect growth in children. Symbicort should not be given to a child younger than 12 years old. 1. What is the usual recommended maintenance dose for Symbicort? Answer: The recommended dose for adults and adolescents over 12 years of age is 1 to 2 inhalations or puffs once or twice daily. 2. Can I use Symbicort for occasional breathing problems or is it necessary to use it daily? Answer: Symbicort should be used regularly to be effective. It does not work immediately and should not be used to relieve sudden asthma attacks.